Warning: I’m going to write about spelling and grammar, which virtually guarantees that I’m going to mangle some word or another. Aside from the title, naturally, which is purposefully mangled. 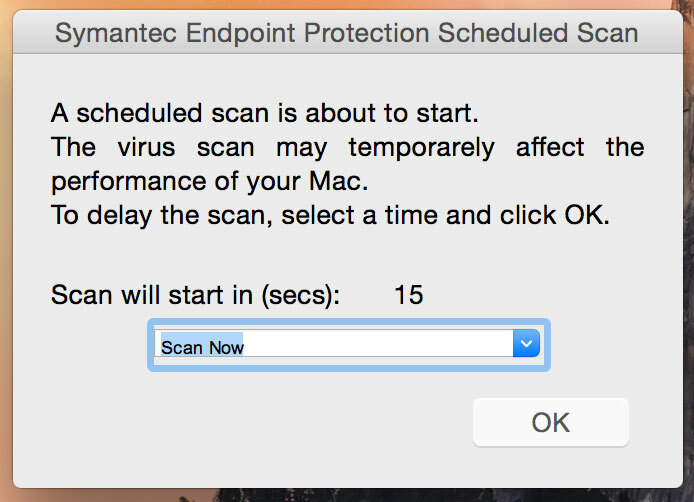 On my work computer, IT has installed Symantec Endpoint Protection as antivirus software. Fair enough; I don’t want to think too much about this stuff when I’m trying to do my job. I avoid most risky, malware-tempting behaviors on my work computer, anyway. (Of course, I figured that if this was some sort of fake AV message, I was probably already infected). After several months of continually dismissing this message without scanning, I finally took a screenshot and forwarded it to one of the IT guys at my company, asking “Is this legit?” He assured me it was, but that our SEP administrator probably had entered that message manually, not Symantec. Relieved, I finally did a scan (no viruses found, yay). A couple of hours later, I had an email from the sysadmin who manages SEP, informing me that the misspelling came direct from the manufacturer. At this point you’re probably saying, why does this matter? It’s just a spelling error. To which I counter, things like spelling, grammar, and typesetting all contribute to having a professional appearance. These are things that inspire trust — misplaced or not. If I received a message with barely-comprehensible English, supposedly from a friend, claiming they were stuck in another country without money, I’d also know it was a scam. I know (how much) to trust my friend’s command of English. It’s even worse in this case, because Symantec is a company that deals explicitly in trust. When you install their software (or your IT department installs it, in my case), you are trusting that their software works and that their definitions address the right malware. You believe your computer won’t be compromised despite (or because of) their product. Little errors like this undermine that trust, as you begin to wonder what else might lack attention to detail. It’s elitist of me, but I apply this standard to a lesser degree to any text that comes into my life. I give a lot of leeway for non-native English speakers, dyslexia, or other mitigating circumstances, but I can’t get away from the fact that how you present yourself in text affects me on a gut level. (Spoken language is not held to the same standard, for the most part. And my husband has often pointed out that I am more language-oriented than most people, so this may be an artifact of that. Maybe this isn’t the same for everyone). One of the big questions in cognitive linguistics has always been, “why is language more complex than is strictly necessary for communication?” I wonder if trust is part of that? Maybe a language with a greater capacity for error gives us a larger number of bits from which to disentangle signal and noise? (Woah. Apparently if you gaze long into your own navel, your navel also gazes into you). @lisefrac we've written defect 3727803 for this typo issue and there should be a SEP release in the mid-April timeframe that will fix it. One more victory for orthography.